An old friend of mine from university – Jo Brown – came round for lunch with her hubbie Paul and lovely young nipper Archie recently. 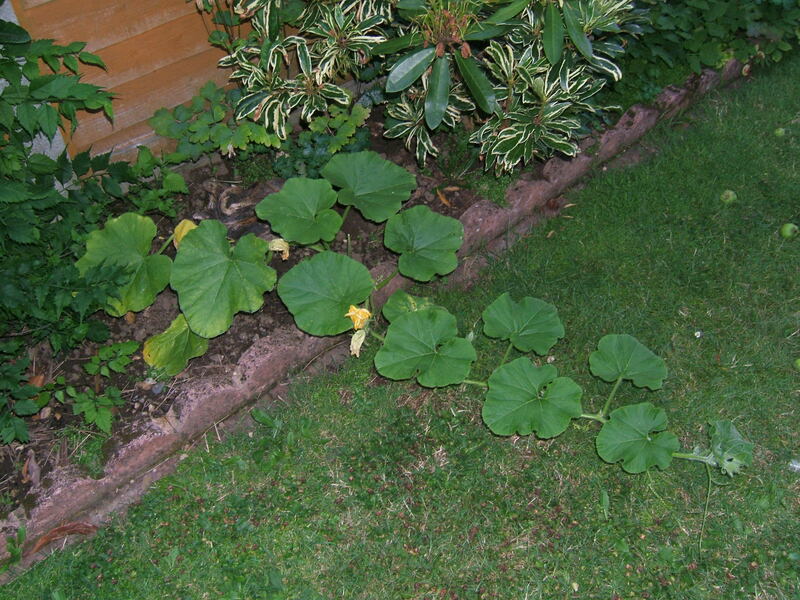 Knowing that my other half Doug is majorly into gardening and we like the good life, brought me a present which she had kindly grown, being a keen gardener and former allotmenteer down in Wimbledon – a giant pumpkin plant. Well, actually, to be specific, it turned out that there were two plants in the pot. Exciting stuff! I’ve grown a pumpkin in the past but not a giant one, so this was a novelty. It sat in a pot outside for a few weeks until Doug pointed out that I really out to do something with the poor guys – pots hardly being the right long-term environment for young giants such as themselves, so a few weekends ago I finally got round to dealing with them. We were a bit stumped about where to put them. Doug has his allotment over in Hertford (will show you some pics of that soon – it is looking pretty impressive, I have to say, and we’ve been eating a lot of fresh produce recently. Courgette, anyone…!) but with everything else there, there isn’t really the space for these guys who need a lot of elbow room. So he thought the flower beds here in our new rental house would be the best solution. To be fair, they’re not that wide but there were a few slots that might work and they’d certainly be happier in the ground than in their pot – especially in this hot weather. “You’ll have to get rid of one,” said Doug, ever the realistic gardener. “I can’t do that!” I protested, being wet. So. in the end, I had to find spots for them both. Sadly they are separated by a few shrubs so they can’t talk to each other anymore, but maybe like many siblings they are glad of the peace and quiet. Who knows? Both are looking good now and they are starting to stretch out – one across the lawn. No pumpkins have formed as yet but we are keeping an eye out. One had started to form on one while still in the pot, but I had to pull it off as the plant had wilted a bit in the hot weather before I planted it out and the tiny pumpkin had started to go a bit yellow and mushy. 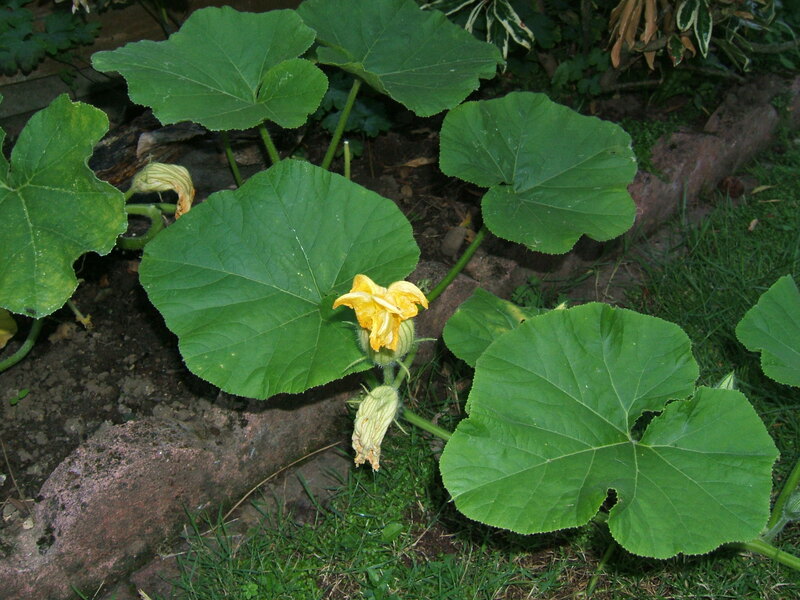 This entry was posted in Food from the garden, Uncategorized and tagged frugal living, growing giant pumpkins, growing pumpkins, Growing your own. Bookmark the permalink. I hope you are enjoying the fruits of your labours by now!! We have grown loads of pumpkins this year and I have been making mega batches of soup for the freezer. Absolutely delicious and 50 times nicer than tinned soup!